Hope Solo is one of the celebrated female soccer players. The American athlete has been serving as a goal keeper on the United States women’s national soccer team for over a decade. She played for the University of Washington. After playing for college team she was drafted into Philadelphia Charge in the Women’s United Soccer Association but when the performance of the team declined, Solo went to Europe and played for Swedish and French Leagues. When she returned to United States she joined Women’s Professional Soccer (WPS) for Saint Louis Athletica and also played with Atlanta Beat. 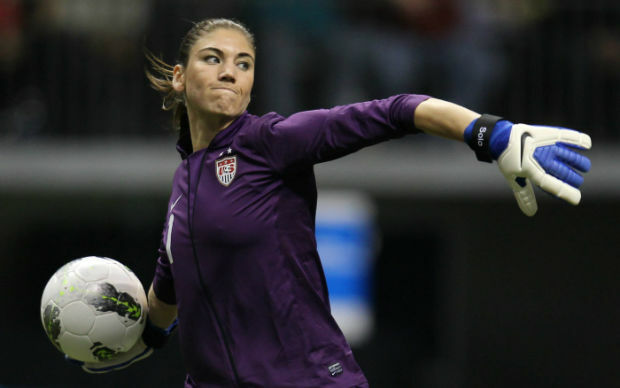 She is regarded as the best female goalkeeper in the world. Moreover, the two gold medals she won during Olympics are testimonials to her incredible skills as a sportswoman. On July 30, 1981, Hope Amelia Solo was born in Richland, Washington, United States. Her father, Jeffrey Solo was Vietnam War veteran from Italian descent. He was not always present in her early life but taught her how to play soccer. Her father once took her and her brother for picnic later when found at a bank by police, he was charged with kidnapping. Hope tried to maintain the relationship him through the years when she was in college. She attended Richland High School, where she helped her school team win three consecutive league titles by scoring 108 goals in a state championship. Before going off to college she also played for the Three Rivers Soccer Club in the Tri-Cities. Several colleges tried to recruit her all over the country but Hope chose to attend the University of Washington. She graduated with a degree in Communication Speech. Playing for Washington Huskies she switched from goal scorer to goalkeeper. In her memoir she discussed the mental adjustment she had to make to fit into the role a goalkeeper. She became in the top-tier goalkeeper in the Pac-10 history. Her college career witnessed 325 saves and 18 shutouts. In her sophomore year she was given the title of Pac-10 Player of the Year, the first Huskies’ player to earn it. Subsequent to her college career, she was drafted into 2003 WUSA Draft in the first round by the Philadelphia Charge. For several games she waited for her turn which never came earlier in the season and finally it did where she shutout a goal against Atlanta Beat. The WUSA folded barely a week before the 2003 FIFA Women’s World Cup which resulted in Hope moving to Sweden. She played for Kopparbergs/Göteborg FC in 2004. In the French First Division, she then played for Olympique Lyonnais the following year. Commenting on her experience of European clubs she revealed that she had a great experience which helped her explore her potential as a person and a player. In 2009, she played for Saint Louis Athletica in Women’s Professional Soccer. Hope was titled the WPS Goalkeeper of the Year. As Athletica folded Hope founded herself goalkeeping for Atlanta Beat. She was given the number 78 shirt. She was the only one who raised her voice against the racist comments and offensive chant against a teammate. The second outburst culminated in fine 2500 dollar fine and was suspended for a game.